Earlier in the day, we were on West 4th heading over to the Candy Aisle after Temaki Sushi. 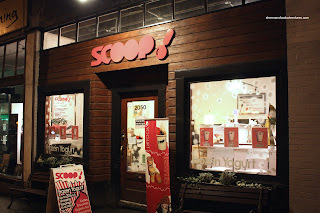 I parked my car across the street and as we were walking over to the crosswalk, I passed by Scoop! frozen yogurt. I suggested to Viv that we really should try it. She was quite adamant that we should not. Guess who won that argument? A bit disappointed, I kept wanting to try it. So fate would have it, we headed to Scoop! after dinner at L'altro Buca. We arrived at a bit earlier than Costanza and Elaine. Rather than waiting for them, I decided to go ahead and order. Yah, some friend I am eh? Hey, it's food we're talking about here! I can't wait! The premise behind Scoop! 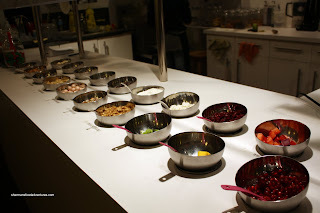 is that you can choose your own toppings from their "buffet"-style display. Much like U-Grill, they weigh your froyo before and after to determine how much you pay. For me at least, I think this novel idea works. When food becomes interactive, people tend to like it and ultimately pay for it too. If you look at the picture, you'll noticed that each bowl does not contain a large amount of each topping. I believe that this helps keep the items fresh. 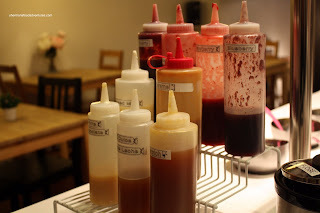 Unlike the big vats at Blueberry World that looked disgusting, the fr uit here was indeed fresh and colourful. So, Viv and I ended up selecting the Raspberry froyo. There was also plain and green tea available. 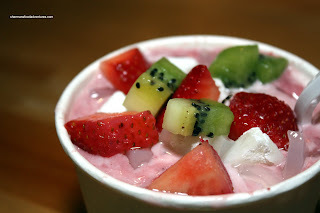 The toppings of choice were mochi, strawberries, kiwi and coconut jelly. The blended froyo was pretty smooth and not too sweet. As you can tell in the picture, the fruit was vibrant in colour and fresh. Even the mochi was fresh, it was pillowy soft. While we were waiting for Costanza and Elaine to arrive, we grabbed a Connect 4 from their stack of board games and entertained ourselves. In addition, there is a Foosball table at the back as well. When they finally arrived, we grabbed Scrabble and had an impromptu game. It's amazing how many dirty words you can make in this game! Makes for some humourous fodder though... I guess the only complaint about the froyo would be that it is blended. That means if you chose anything but plain yogurt, it needs to be manually mixed with the flavouring agent. This tends to make the froyo a bit soft and it ultimately melts faster. Other than that, not much to complain about, it was fresh and tasty. - You get to play board games! I would stick with the vanilla flavour as blended flavours tends to melt even faster in the summer time. I love their fresh hand made mochi, but they're a bit stingy on their fruit toppings. I don't think I would make a special trip to the west side just for this but if I happen to be in the area, a stop at Scoops would be refreshing. Due to lack of air conditioning, it does tend to be stifling in the summer, but otherwise, playing games, especially scrabble and eating yogurt would be a plus. I was foiled twice by scoop, the first time we were there it was closed and the second time we were too early...and getting hungry so didn't wait around. Both times were in the summer. Looks fun tho, self serve & there are board games...in fact, my next post will have board games too! Connect 4 is a boardgame? There's no board at all! Sorry, off topic, I know. LOL. Holly, I would second that. The blended just melted so darn quick! Yes, I love the board games. I should play battleship next time! Jenny, we can go as a group next time and play all the games! I agree with holly, it's actually they're original yogurt. They corrected me the last time I went. Their description is it's tart and sweet. Definitely holds up a lot better than the blended and not as sweet!